Compete has published their latest stats for Total Time Spent Online – and they make clear that people are rapidly moving their attention from traditional media to online media. 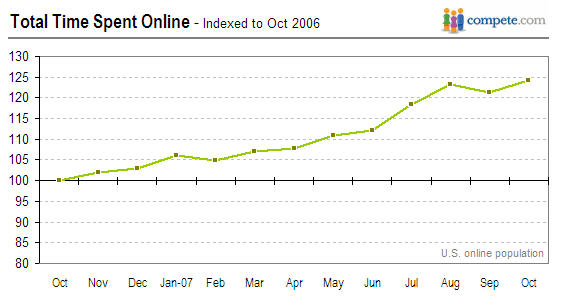 Time spent online is up by nearly 25% since last August. “We are spending more and more time consuming information online. Logically, since time is finite online advertising spend should follow a similar trajectory with marketers allocating their ad budgets in proportion to where people are spending their time. People are rapidly moving their attention to the Internet, and there’s no sign of this trend leveling off or stopping anytime soon. Add to this the fact that advertisers are lagging behind people in moving to the Internet, and it’s clear that we’re going to see a long period of growth in both consumption of new media and money flowing into new media. Thanks for catching that instantaneously! More proof that Podcasting News readers are geniuses. Or maybe I just didn’t have enough coffee this morning!